It's easy to be cynical about 50 Cent when you consider his previous form in the UK. 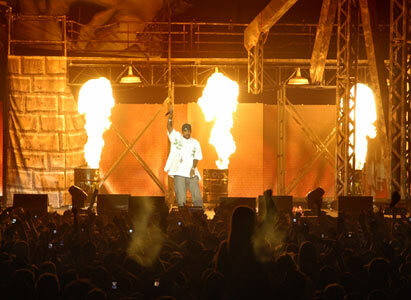 Reports of his last Manchester show were testament to the old adage that take a rapper out the studio and onto the stage and they fail completely, the Leeds and Reading Festival shows saw him bottled off stage (although in truth that says more about the narrow-minded rock fans than Fiddy) and then the Anger Management Tour got cancelled due to Eminem's exhaustion. 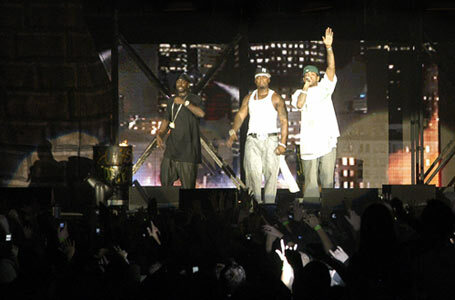 It would have been easy for 50 to ignore the UK fans, sit in his mansion, but full credit goes for him hastily arranging his own dates at short notice and if anything the fact that he can sell out the MEN Arena within about 2 weeks notice only goes to prove that as many people bought Anger Management tickets for Fiddy as they did for the retiring Slim Shady. 50 Cent's tale is inspiring, intriguing - the ultimate in rags to riches tales. The gangster with a disarming smile and head for business that has seen him empire take in computer games, films and clothing line as well as pick up production credits on a host of upcoming artists. Larger than life we've seen the likes of 50 Cent come and go and we know how the rap wars and feuds end with the tragic loss of Tupac and Biggie, but if you take away from the fact someone of my age has seen the likes of Ice T and NWA unleash a less compromising style of gangsta rap and place yourself in the mind of a 12 year old kid, Fiddy is the most exciting thing to happen to their life. Whether they truly understand the real nature of getting shot 9 times or not is questionable, but it's more likely they see 50 Cent as an all American Action Hero rather than the reality of taking a bullet in the chest. Slurring out the words, due to a previous injury, 50 raps his way over polished produced tracks such as "In Da Club", "Wanksta" from "Get Rich Or Die Trying" through to cuts off the Massacre like "Candy Shop", "Disco Inferno" and "Jus A Little Bit". With only 2 albums behind him his set already seems like a greatest hits set and even the appearance of hip hop legends MOP, Mobb Deep and Mase don't distract from the fact this show is all Fiddy. Small in stature, but stacked up after spending his life in the gym. Despite spending the best part of the show advertising his latest products, make no mistake in thinking that this guy isn't serious about the music. Following tonight's show he drove up to a low-key studio in Wigan, downloaded the instrumental tracks for ideas G Unit were working on and then wrote and record lyrics for 6 songs there on the spot. The 50 Cent tale just got a whole lot more interesting and after a few rocky starts he's now delivering the goods in the live shows. Read the full story of 50 Cent's visit to Wigan exclusively at Designer Magazine - the only publication that were there to witness this astonishing event. Click here for the full story!! !